NEW YORK (June 20, 2016) – Undefeated IBF Heavyweight World Champion Anthony Joshua (16-0, 16 KOs) will make the first defense of his title against fellow unbeaten Dominic Breazeale (17-0, 15 KOs) of Upland, Calif., this Saturday, June 25 on SHOWTIME BOXING INTERNATIONAL® from The O2 in London, live on SHOWTIME® on at 5:15 p.m. ET/2:15 p.m. PT. Just a few hours later in Primetime on CBS (9 p.m. ET/6 p.m. PT), Keith “One Time” Thurman will defend his WBA Welterweight World Title against former champ Shawn “Showtime” Porter in a welterweight blockbuster that headlines SHOWTIME CHAMPIONSHIP BOXING on CBS, presented by Premier Boxing Champions. 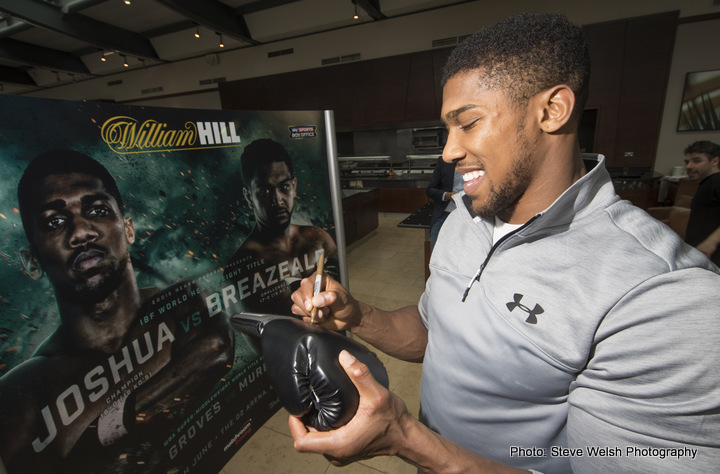 Both Joshua and Breazeale participated in an international media conference call on Monday. Also taking part were Stephen Espinoza, Executive Vice President and General Manager of SHOWTIME Sports; Eddie Hearn, Managing Director of Matchroom Sport and Brittany Goossen of TGB Promotions introducing Breazeale. Below are highlights of what the principals had to say on the conference call. A full transcript will be available in the coming days. “I feel great condition wise, and mentally I’m in a good place. I’ve never felt so relaxed because I just know I’m capable of doing it. I’ve trained weeks and years and it’s just about getting it right on the night of the fight. My tactics and my mind have not let me down so far, so that’s why I don’t want to change anything. “I’m not putting too much pressure on myself. I’m going to attack the fight the same way I have my last 16 and put on an explosive show. That’s what the Americans love. They like knockouts and I won’t let them down. “Every fight can be my last fight. As much as I would like to tell you I’m confident and ‘I’m going to do this, I’m going to do that’ I do understand I have to approach this as if it could be my last fight. “I’m not the cream of the crop in the gym. I’m around guys that are achieving things on the same level so I’m still hunting. I still have that mentality as if I’m a main killer in the jungle. I haven’t lost that hunger. “The way I’m thinking about it is, June 25, I gain 20,000 fans. I’m in a situation where I’m very confident going into this fight and I know for sure I’m going to put on a great show, come out victorious and go back to the U.S. with 20,000 UK fans. “I definitely believe [Joshua] realizes; he understands that he’s got a big test in front of him. He’s got a big fighter in front of him. He’s got a guy that’s going to break him down, test his will and see if he is a true champion. “I am coming into this fight very confident and I’ve got some things that I know are going to work for me, as well as some things that I plan on exploiting out of Joshua. “Anthony quickly went from a diamond in the rough to really one of the foremost stars in the UK and Europe, and we are happy to be his partner as he establishes his presence in North America. Also follow Dominic Breazeale on Twitter @TroubleBoxing, Anthony Joshua @AnthonyJoshua and use hashtag #JoshuaBreazeale to join the conversation.